My mother is known throughout the world as "Fiona of the Seals." She is a passionate animal rights advocate, musician, author, and mother to three daughters. 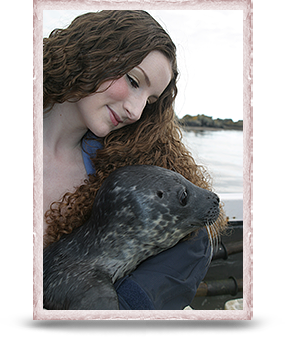 Fiona composes her own music which she performs on the violin for a special audience – the seals who inhabit our island. Selkies are the fairies of the sea who appear to us as seals. They can shed their skins to reveal a human form and often come ashore to dance. Fiona grew up in the English village of Seal (not a coincidence!) where she trained as a classical violinist. In the late 70s, she and my father fell in love and moved here. Together with my father George and other members of our family and community, my mother cares for seal pups and acts as their advocate. Her dream is to build a seal hospital and sanctuary on Islay. For over 30 years, my parents have fought to save these beautiful "fellow travelers" and raise awareness about their plight. Fiona's book, 'Seal,' describes their ongoing efforts.